Normally I write here about personal spirituality, which is about working on ourselves to be better people and achieving greater happiness and contentment in life. So, I tend not to talk about outward, external, and social-level issues. Recently, however, I submitted a proposal to the Occupy movement, and would like to talk about one exchange I just had with a poster on their Facebook page regarding forgiveness. In my writing, I have frequently promoted the ancient notion that virtue is both necessary and sufficient for happiness; and when it comes to making virtuous decisions, this often involves the correct choices with respect to our outward actions. Contemplative inner spiritual cultivation ultimately gives us a greater bedrock of strength and fortitude as we move out into the world to do good things. Contemplative practices help to keep the activist from 'burning out' or becoming hopeless in the face of steep challenges. This is because it helps us to shift the seat of our focus from external circumstance, to internal value. We are able, though proper wisdom and practice, to detach our contentment from our conditions, and instead make the source of contentment and peace come from our inner character and pure motivation. Instead of thinking, "I must make the world better" - we come to think, "I must be the kind of person who tries to make the world better". When we achieve this shift deeply into our intuitive responses, we place our happiness solely within our control. We free ourselves of circumstance, and so we have already succeeded, even before the results of our attempts are manifest; regardless of what happens. This internal shift happens slowly, in degrees over time, through the application of wise philosophy via disciplined practices. I cannot claim to be an "Occupier" as I haven't put in physical presence time, but I do agree with the gist of their complaints and think they are worthy causes. Further, I think most of their non-violent tactics, albeit imperfect, have been justifiable (with the exception of some on the fringe who have used violence and hatred). We can't know where the movement will go from here, but recently there have been a number of negative incidents with police in several cities which have made the news (and many positive ones which have made the news to a considerably lesser extent). What I suggested, was that the movement host a "Day of Appreciation for Our Police". I included possible wording for a proclamation to be made on that day (the full body of which can be read below). I put this to friends on my Facebook page first, and then shared it to the Facebook pages of Occupy Together and Occupy Wall Street. I also emailed it to the address given on their website. This is an excellent idea - it's constructive, innovative, and good public relations. The only part of your suggestion that I disagree with is where you suggest the following: "To those officers who have assaulted unarmed and non-violent citizens with tear gas, pepper spray, rubber bullets, beatings, and other forms of violence, we forgive you."What?!!! Such behavior is fascistic, and intolerable, So we should no more forgive those who behave in that manner than we would forgive the Nazis for their atrocities during WWII, or Bush and Cheney for their atrocities in Iraq. We're not missionaries, so let them seek forgiveness from Jesus in the hereafter, but we must vigorously condemn and ostracize such people here on Earth. This is a common (but unfortunately flawed) understanding of forgiveness. It views forgiveness as a benefit to the forgiven instead of the forgiver, and it imagines that forgiveness excludes condemnation of the behaviors or somehow accepts them, or calls for less vigorous action to fight them. In previous articles, I have explained how forgiveness is a gift we give to ourselves. This is made easier when we recognize how harmful unvirtuous behavior is to us, as I have explained in, On Retribution: How Bad People Lose. I later describe a technique for increasing our empathy for wrongdoers in Motherhood as road map to universal compassion. In Jesus in New York, I refer to Jesus' teachings on forgiveness as I call on Christians to invite Muslims into their homes for a meal. And, in a longer essay, Freethought and Compassion, I examine that prescription to love our enemies and why it is essential that we forgive, specifically when it is not deserved. Lastly, the poster I quoted above said, "We're not missionaries..." I beg to differ. 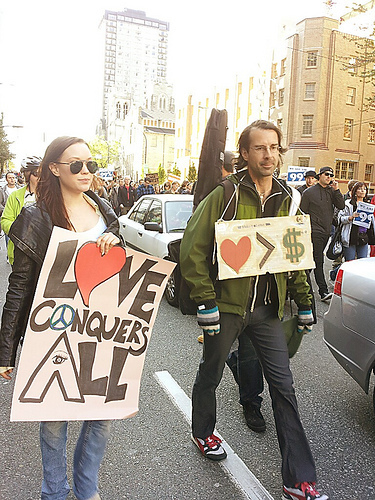 The Occupy movement is a mission, and in its underlying values it has an ethical dimension. In my response I mentioned an anecdote I had passed along in On Loving Humanity about Buddhist monk Palden Gyatso, who was held and tortured as a political prisoner in China for 33 years. He'd been beaten, starved, burned, shocked, and put into forced labor. Released in 1992, Palden does not hate his captors. When asked what his greatest fear had been, he said that what he most feared was losing compassion for his torturers. Forgiveness is perhaps the most important part of the following declaration, and it will be healthy medicine for those in the movement. - We would like to thank those who work as our nation's police. We want to thank you for your service in protecting us and in enforcing just laws. We appreciate that you place yourselves in harms way every day for our security and safety. - As middle class workers, you too are one of us, the 99%, and we support better pay, prosperity, and opportunity for you as well. - We encourage people to vote and to exercise their Constitutionally protected free speech rights within the law. But in addition, because the extreme corruption in our system limits the effectiveness of only using means available within that system, we have chosen to additionally use the age-old practice of peaceful resistance and civil disobedience in working for our cause. While this is an illegal activity, we do not condone the use of violence against anyone, nor the unrestrained breaking of any and all laws. - Please know that the use of civil disobedience does not equate to disrespect for all police, law, or order, or equate to hatred for you - even if individuals in our large and diverse group may have said and done things to that effect. - We therefore want to apologize for those few individuals among us who have used violence and strayed from our non-violent resistance principles, and those who might do so without our approval in the future. - We recognize that your duty will be to arrest us when we break the law, and expect the minimum use of force necessary to do so, as per traditional policing principles in a democracy. We do not agree with some police officers who have chosen to use assaults and violence in response to non-violent protests. - We recognize that most of you want to do good and conduct yourselves nobly and professionally. We therefore invite you to avoid and resist these kinds of responses in the performance of your duties. - To those officers who have assaulted unarmed and non-violent citizens with tear gas, pepper spray, rubber bullets, beatings, and other forms of violence, we forgive you. This does not mean we do not call for you to be held accountable for your actions and face disciplinary measures, and it does not mean we do not demand an end to such behavior. It also does not mean we believe all of you may be deserving of forgiveness, or be asking it of us. But we forgive you because we want to be better than those who have wronged us, and we want to express compassion even for those who have harmed us. We hope the above statement of principles will help to facilitate understanding between the Occupy movement and police departments. Having made them, we want to emphasize in closing the purpose of this day, which is to honor you and your service to our communities, and hope that someday our actions will benefit all of us.